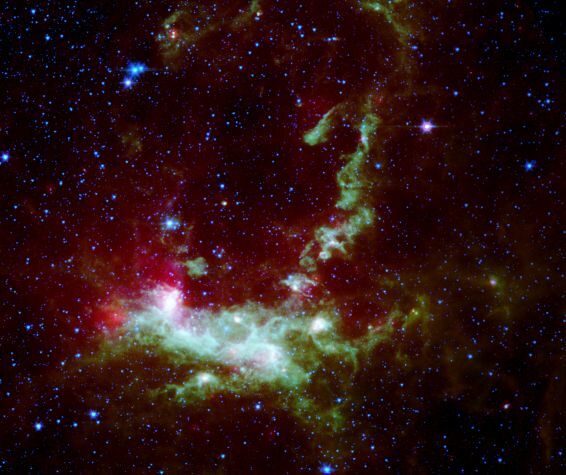 Explanation: Peering into a dusty nebula in nearby galaxy the Large Magellanic Cloud, infrared cameras on board the Spitzer Space Telescope recorded this detailed view of stellar nursery Henize 206 filled with newborn stars. The stars appear as white spots within the swirls of dust and gas in the false-color infrared image. Near the top, the sweeping telltale arcs of a supernova remnant are also visible, expanding debris from the final explosion of a massive star. The proximity of the ancient supernova indicates that the shockwave from that stellar death explosion itself likely triggered the formation of the new generation of emerging stars, compressing the gas and dust within Henize 206 and continuing the cosmic cycle of star death and star birth. At the distance of the Large Magellanic Cloud, about 163,000 light-years, this image covers an area about 1,000 light-years across.